Our Company puts a high priority on the safety of our products. This website provides information about SRS-Airbag inflator safety recalls only. For other recalls please contact your authorized Honda service center. All safety recall repairs are FREE at authorized Honda service center. Your search results indicate that your vehicle is affected by a Recall. Please schedule a visit for Recall repair free of charge at your nearest service center. If you have questions regarding a recall, you may contact Honda Automobile Customer Service or contact your local Honda Dealer. 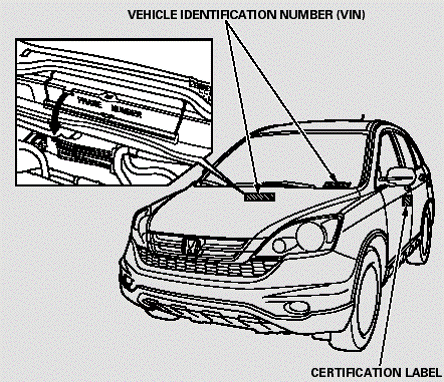 Every vehicle has an unique 17-character Vehicle Identification Number (VIN) that contains information about that vehicle. Below is an example of a VIN. Please enter the correct Vehicle Identification Number (VIN) or contact your nearest dealer! The most effective way to determine whether entered 17 character VIN is subject to Recall or not and the repair is completed or not. VIN search results will allow you to confirm the related Recalls for the entered VIN and the status of repair. Vehicle model year and model search will give general information of the Recalls applicable for that particular searched model and model year, it does not mean that all vehicles for that particular model and model year are affected. It is recommended to enter VIN details to get exact Recall information.